From the time they begin to speak, young children are counting almost everything they see. And what better way to teach little ones to count than learning about God’s blessings? Kids will be led to count to ten with Mom and Dad as they see the many different ways God blesses them: with food, clothes, a house, a loving Mommy and Daddy, and more! And this “fit-together” board book features bold, colorful cut-outs on each spread that showcase the blessings in a fun, dynamic way. 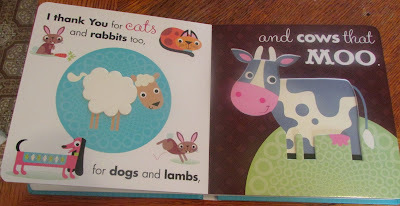 The cut-outs for each spread “fit” together when the book is closed, creating a fun surprise for kids on every page. It may be a board book with only ten pages, but Count My Blessings 1-2-3 is full of cute illustrations with bright colors and patterns. Raised die-cut shapes make it pop out even more. Told in rhythmic form, this adorable book for toddlers shows foods, numbers, animals, and more that children are thankful for. One person will win a Count My Blessings 1-2-3 Children's Book. I am thankful each and everyday my kids and I wake up. Every day is a gift, no matter how bad the day might seem. I am humbly grateful for God's grace and mercy and my family. They are the cement that keeps me together in life. I am soooo thankful for my grandkids, they keep me laughing and on my toes!! I am grateful for each day I have with my family in good health. I'm grateful that my entire extended family was able to gather for a family BBQ yesterday. So grateful for God's many blessings on our family and our church. I am thankful for friends & family. I am thankful for everyday that I have another chance to love my son, family, friends, and everyone more and more! I am most thankful to be a mom and also for my husband. I am thankful for our family. I am grateful for my family and friends well being.